Canada has five organic equivalencies, including four with key importing countries and regions—the United States, European Union, Japan and Switzerland. Our equivalencies give Canadian companies access to the organic market of 32 countries that represent more than 90 percent of the overall demands for organic worldwide. COTA plays an important role in helping its members explore new markets and representing the Canadian organic brand abroad. In place since 2012, COTA’s Export Program builds opportunities for our members, helping them to build a solid comprehension of international markets and networking with key foreign buyers. Over the past two years, the Export Program has supported more than 62 companies in five different countries, and generated more than $12 million in direct sales. This year, COTA is putting together a program targeted to most of the key international markets. The export program is exclusively for members that qualify as export-ready. Japan (November 2016): For the second year in a row, COTA will host a delegation of organic companies in Japan. Two tabletop missions—one in Osaka and the other in Tokyo—will be combined with a presence at the new Organic Life-Expo trade show. These unique opportunities will help build brands and offer connections with qualified buyers. 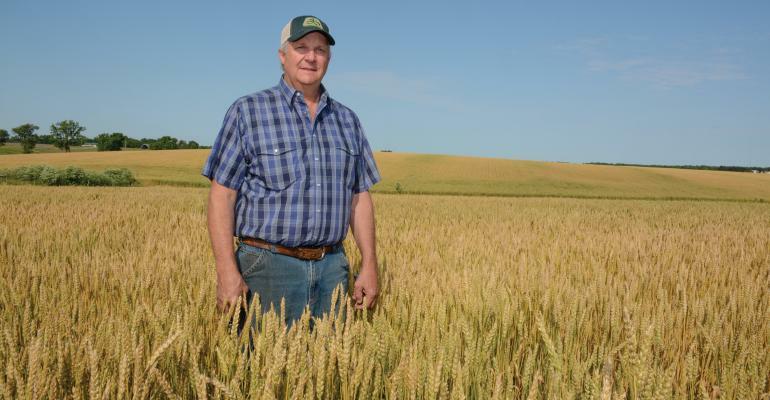 Organic Connections—Reverse trade mission (November 2016): This bi-annual conference for the Prairie organic growers mixes practical workshops with marketing information sessions. 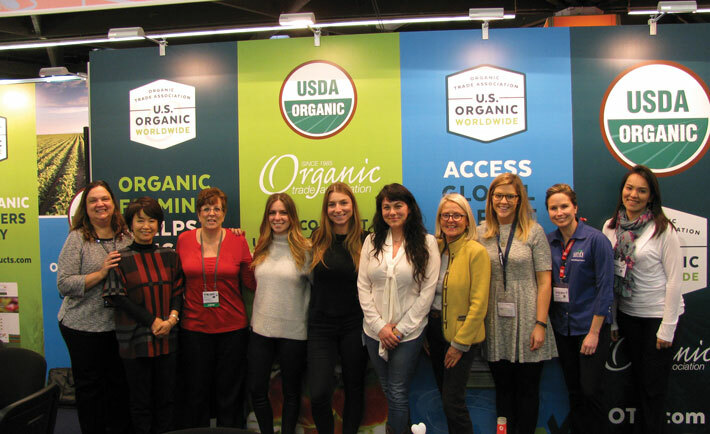 COTA will host an incoming International Buyers Mission at Organic Connections, bringing commodity buyers from around the world. Sign up now for BioFach (February 2017): Registration is now open for companies interested in joining COTA’s incubator stand at BioFach 2017. This is the perfect option for companies exhibiting for the first time at BioFach that want a turnkey stand. 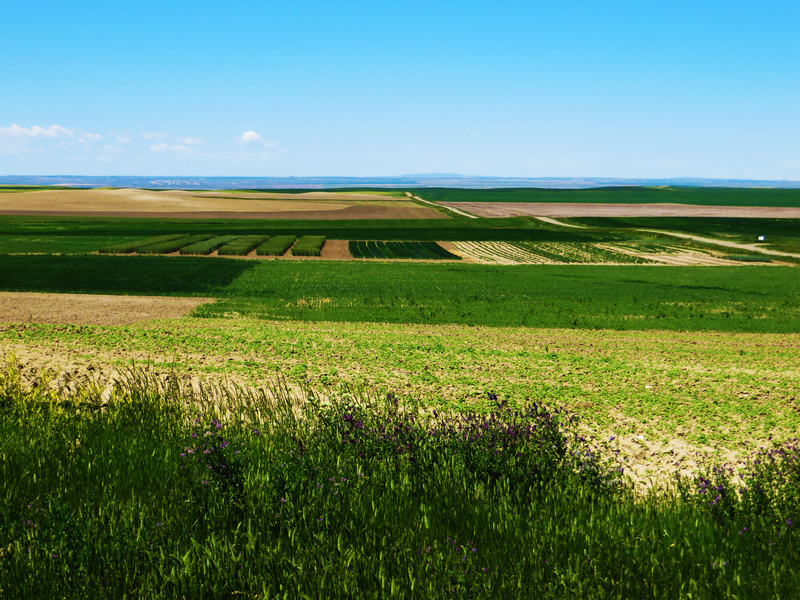 MOSES (February 2017): The MOSES organic farming conference is a pivotal conference for North American grain growers and traders. Farmers and traders attend to learn about the latest agricultural techniques and plant breeding, to build the organic community, and to do business. COTA will provide support to organic companies wishing to exhibit during the trade show portion of the conference. Natural Product Expo West (March 2017): Expo West is the leading meeting of the organic industry in North America. COTA’s program includes networking and education seminars for its members. Limited funding and support for new exhibitors and walkers are also available. Registration for the event will start in Fall 2016. The Organic Product Regulations will be incorporated into The Safe Food for Canadians Act (SFCA) once the regulation is approved. It is expected to be published in the Canada Gazette, Part 1, this fall for consultation. New regulations under the SFCA would replace 13 current regulations under the Canada Agricultural Products Act, the Fish Inspection Act, the Meat Inspection Act, and the food-related provisions of the Consumer Packaging and Labelling Act. COTA attended two day sessions held by the Canadian Food Inspection Agency (CFIA) in early June to provide feedback from the organic sector on challenges that exist for organic and to learn of operational changes that CFIA will implement as a result of SFCA. One of the changes that will occur under the new regulation is the Fisheries Act will be housed under SFCA, which will result in the Organic Aquaculture Standards to be regulated by CFIA, and the use of the Canada Organic Regime (COR) logo on aquaculture products will be permitted in Canada. Organic sales remains stable as Canadian consumers maintain their spending on organic food, according to findings from the Canada Organic Trade Association’s latest national consumer survey conducted this summer. The study aimed to understand consumers’ awareness of the benefits of organic agriculture, their level of trust in organic and non-organic claims, and their organic purchasing habits. Eighty-six percent of Canadians expect to increase or maintain their organic spending in the near future. The number of consumers who regularly buy organic in the country remains stable at around 20 million (56 percent of Canadians). Survey respondents indicated that 11 percent of their total grocery purchases for the household are organic purchases. On average, organic grocery shoppers spend only $26.70 more per week for groceries compared to non-organic buyers—representing $9.20 more than in 2012. The organic shoppers’ weekly grocery basket added up to $132.70 four years ago compared to $143.40 today. The organic fruits and vegetables food category is still high on the shopping list of Canadians. When buying organic, consumers primarily seek fruits and vegetables. When asked about the most likely categories of organic foods that household usually buy, 77% of the respondents said fruits and vegetables, followed by organic milk/ dairy product (23%) and organic meat/and or poultry (22%). Households with children are not surprisingly most likely to buy organic dairy products (28%) than the average Canadian grocery shopper. The face of organic is changing as more “millennials” are shifting towards organic, with market growth in part driven by this age group. One in five (21%) shoppers from 18 to 34 years say they are buying more organic, while shoppers in older age groups are holding steady. Young adults spend proportionally more of their budget on organic food than the rest of the shoppers. One quarter (25%) of “millennials” spend between 10-24% on organic compared to 19% for 35-54 year and 12% for people of 55+. Overall, on average this younger generation spends 23% of their food budget on organic. Canadians are buying organic to avoid pesticides, chemicals and artificial ingredients. Organic food buyers are motivated to seek out organic foods/beverages by both negative and positive factors, with avoidance of artificial ingredients and avoidance of pesticides/chemicals the top two reasons cited for purchasing organic food. However, the organic sector still has work to do to increase awareness of the Canadian organic logo introduced only seven years ago. Overall, just over one in four (29%) Canadian adults and one in three consumers from households with children (35%) say they are very familiar or somewhat familiar with it. While we see the market growing, consumer education remains pivotal to increase the awareness about the organic logo and what it stands for. On May 31 and June 1, COTA attended the Public Trust Summit hosted by Farm and Food Care to learn more about the work and research conducted on Canadian consumers’ trust in the Canadian food system. Results of a web-based survey conducted by the Canadian Centre for Food Integrity Public and posted on www.farmfoodcare.org. are based on findings from 2,510 respondents. Only 30 percent of respondents believe that the Canadian Food System is headed in the right direction, with 21% of Canadians feelingt we are headed down the wrong track and 50% unsure of where our food system is headed. These statistics are making food players and government in Canada wake up and evaluate how and why this public trust has been eroded and how to gain “Social License” (defined as the privilege of operating with minimal formalized restrictions based on maintaining public trust by doing what’s right). The organic industry in Canada has worked tirelessly to create public trust by ensuring that traceability, verified by third party, following international recognized ISO17065 protocols with sound environmental and ecological practices are used and regulated by the Canadian Food Inspection Agency. Our attendance at this meeting was to share our best practices and to learn what conventional agricultural groups and value-chain roundtables intend to do to regain the trust of Canadians. 41% are concerned about eating food that comes from GE crops. 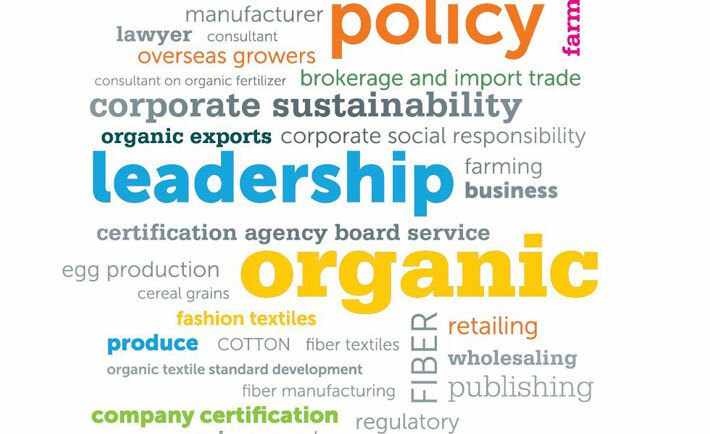 The organic industry continues to conduct its own research to well position the sector and ensure it is maintaining and protecting consumer trust. With our public outreach campaigns, partnerships with other groups, and outreach to business communities in Canada, we continue the journey, building consumer confidence and awareness of all that organic has to offer. COTA met with nine Members of Parliament since the month of April to further government relations with key actors officials the country. In each of these meetings, COTA presented a map of each MP’s constituency to outline the organic businesses in their district, and provided an overview of how Canada is doing on a world stage as well as comparisons between sectors and regions. It is important to present our sector’s key challenges to Parliamentarians in Canada and to receive guidance from supportive MPs on how to navigate the political system and regulatory framework challenges together. In each meeting, COTA was received very positively, with fruitful dialogue. It was gratifying to personally request the presence of key Parliamentarians at COTA’s fall events, namely our Parliament Day and Policy Conference. Parliament Day is planned for October 26 in Ottawa, so save the date! The Board of COTA met June 21-22 in Ottawa for its Annual Board Retreat and review of the 2015-2016 Fiscal year. This past year was filled with many experiences that the association had never encountered before. With the departure of Matthew Holmes as its Executive Director at the end of December 2015 and the new hire of Tia Loftsgard as the incoming Executive Director in March, this year’s review was a positive time for the Board and staff to come together to take a fresh look and examine the possibilities of where to take COTA in our fiscal year commencing July 1, 2016. Work plans—including trade missions, targeted government relations plans, new hires, strengthened member benefits, robust Organic Week and partnership planning and the vision to create COTA’s distinct own website—were presented to the Board for their input and to learn the Board’s list of priority areas for the coming years for COTA. COTA’s Annual General Meeting will be held in Toronto on September 15 where more detailed plans and Annual Report will be distributed to members. The Board and staff anticipate a fantastic year to come with elections occurring to bring on new Board members (four seats up for election) and an exciting vision for the future of COTA. Contribute to the Organic Transition program by providing certified organic farmers with a set of marketing materials. COTA developed new print materials specific to the BC organic sector to initiate consumer education and better awareness of the BC Organic Checkmark and Canada Organic logo. A series of postcards and posters were released in September 2015 to coincide with national Organic Week. 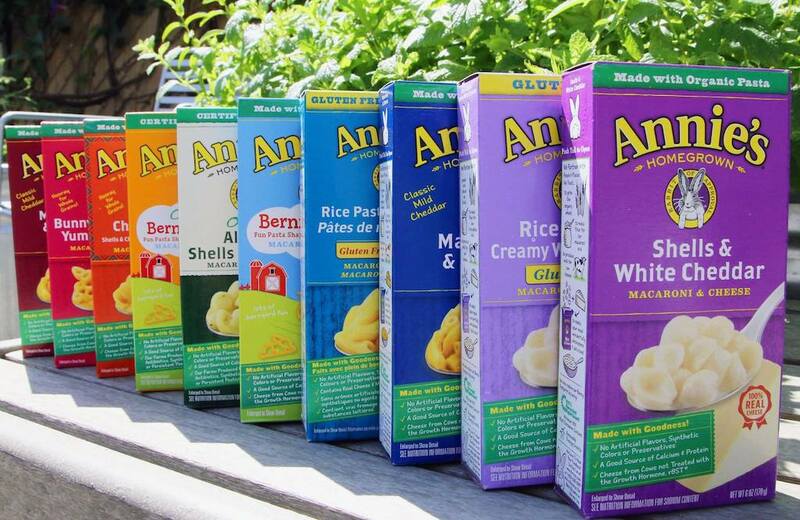 These put consumers of organic front and center, and became the foundation of the Think BC Organic campaign. 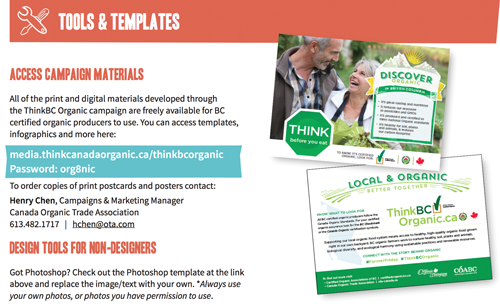 Along with the release of the print materials, we began to profile BC organic farmers on the national website for the Think Canada Organic campaign—ThinkCanadaOrganic.ca. 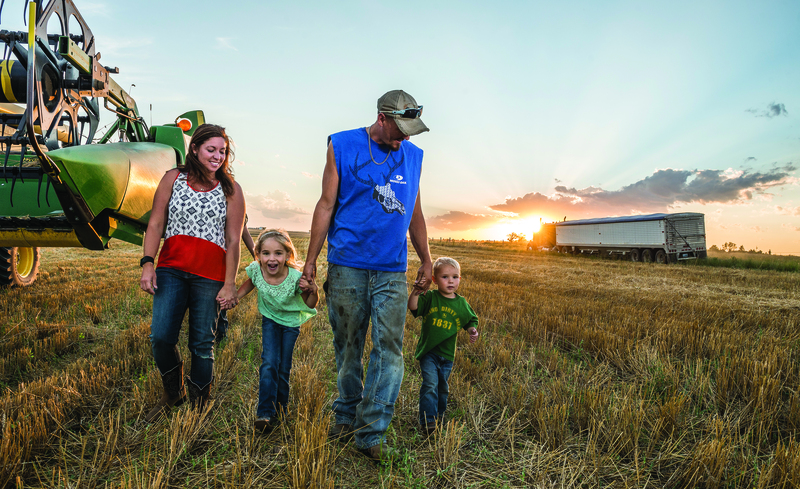 Based on an analysis of consumer research and the early success of the farmer profiles on social media, we developed a full social media campaign running under the tags #FarmerFriday #ThinkBCOrganic. Producers have a commitment to people’s safety and regulatory oversight. We felt that certified organic producers are by and large meeting these requirements for trust as they are using a knowledge intensive form of production and operate under a transparent and closely monitored food production system. However, there is a lack of knowledge among consumers about the rigour and practices that are part of organic certification as well as the values that provide the foundation of the organic community. To implement the strategy and make the consumer education campaign a success both in terms of audience reach and long-term usability for BC organic producers, we focused on developing a campaign that could be self-sustained. To achieve this, we focused on building partnerships and creating digital and print materials that could be openly accessed by the BC organic community and broader value chain. Over the course of the campaign development, we established partnerships with the BC Association of Farmers’ Markets, Certified Organic Associations of BC, health & wellness publications, consumer shows, local organic farmers business and distributors. Through the partnerships we built and the momentum gained during the campaign, it became clear that there is broad support for BC’s organic producers. Businesses all along the organic value chain are keen to connect their consumer audiences with the voices and stories of BC farmers.